A few short steps from the semi-private, white sand Kahana Beach lies the Kahana Outrigger Resort. This resort is located oceanfront along the West Maui shoreline, situated centrally between the renowned Ka`anapali and Kapalua Resorts. A quiet and family-friendly complex of only 16 units in four buildings, Kahana Outrigger Resort is the very definition of tranquility. Look out across the Pailolo channel and see whales breaching with their young and turtles cruising through the beautiful, clear waters along the protected reef. Escape from the crowd and find peaceful serenity among the lush resort grounds, offering well maintained tropical vegetation. Located on the ground floor, Unit 3A1 is positioned fully and directly ocean/beach front with easy access to the grassy lawn and beach from its newly renovated Lanai! This deluxe three-bedroom and three-bathroom condominium is breathtaking, offering unparalleled proximity to the ocean. You are literally oceanside—not 40 feet from the water! Be soothed by the soft lapping of waves on the shore as you retire and wake up in the luxurious master bedroom. When ready for a leisurely stroll, step out onto the grassy lawn in front of the condo; in only about 10 steps you will bury your toes in sandy Kahana Beach. Be sure to return to your lanai in the evenings to enjoy a cool beverage while taking in breathtaking sunsets. This experience is not to be missed! The spacious condominium of 1,450 square feet all on one level beckons with the feel of a quintessential Maui beach house. Ceramic tile floors and tub/showers throughout; custom sapele ribbon wood cabinets capped with premium granite countertops; and all-new, premium appliances ensure an upscale Hawaiian experience. New furnishings and décor are showcased against a backdrop of Venetian plaster walls and exposed-beam cathedral ceilings. There have been a number of recent upgrades in addition to the appliances and furnishings, including: new solar screens, new ceiling fans, new skylights, new roof, and touch-up painting. Although the condominium offers air conditioning throughout (and new AC units have been installed in the bedrooms), it is also ideal for open-air lovers—plenty of windows positioned to make the most of Maui’s cooling Trade Winds. The environment is beautifully luxurious, airy, and inviting. Three bedrooms and three bathrooms offer plenty of space for up to eight guests, with a king bed in the First Master Suite, a queen bed in the Second Master Suite, a queen bed in the Third Bedroom, and a queen sectional sleeper sofa in the Living Area. Additionally, the property is fully stocked with everything imaginable you may require for a superior stay: top-of-the-line linens and towels, dramatic four-poster beds, iHome clock/stereo docks for your iPods and iPhones, four TVs with premium cable service, free long distance in North America, free secured Wi-Fi Internet accessible from inside the unit, new wireless printer/fax, beach toys, beach towels, beach chairs, beach umbrellas, binoculars, and a rolling cooler…the list goes on and on. Truly this property presents the ideal blend of luxury and comfort in a gorgeous tropical setting. 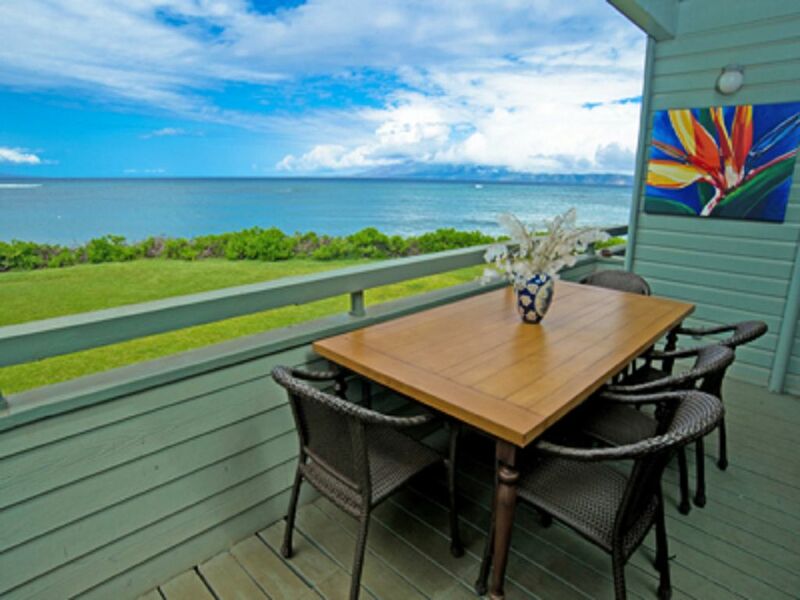 Step out onto the private Lanai and bask in glorious views of the neighboring islands of Lana`i and Moloka`i, not to mention seasonal whale watching and unforgettable sunsets each evening. Relax and enjoy the pool and recently refurbished BBQ area or head to the beach for some of Maui’s best swimming, snorkeling, paddle boarding, and boogie boarding. A short walk from the condominium will bring you to nearby restaurants and shopping. Alternatively, drive just 10 minutes to world-class golf and tennis, or to Lahaina town for shopping, restaurants, art galleries, museums, and nightlife. We hope you will visit us and experience our Maui beach house for yourself! Condo Situated Approximately 10-15 Yards From the Ocean! Free long distance (North America). Multi-Zone, split air conditioning system. Private dryer inside the unit for Guests' use. Secured WiFi Internet is Provided FREE of Charge! Brand new refrigerator. Filtered Water Available. Seating for 8 at dining table; seating for 4 at breakfast bar. Premium cable television service provided on all televisions. Beach toys and beach chairs provided. Grassy lawn and well-maintained tropical foliage. World-class golf courses within 10 minutes (Royal Ka`anapali Resort and Kapalua Resort). Oceanfront/Beachfront swimming pool with BBQ area and plenty of seating. Some of the best whale and turtle watching on the entire island is from the condo's private Lanai! Location and small complex makes this a gem. Nice size unit with everything needed for a pleasant stay. Really appreciated the included beach chairs in the condo. Had a wonderfully stay. Beautiful clean condo with a fantastic view. My family of 6 enjoyed this lovely condo. As a family group of 4 adults, a baby and a 4 year old, this condo was perfect for us. There is a grassy area directly in front of the lanai, then a beach just steps away. This unit is right beside the pool and BBQs. As there are only 16 units in the complex, there were always lounge chairs available around the pool. In fact, we usually had the pool to ourselves. Overall, this is a perfect location for a family vacation. The unit has a great view with a lot of room in the living room. The bedrooms were large and our family had a great time. We would stay here again if the circumstances allow. The best whale watching on the island can be found on your own private lanai!